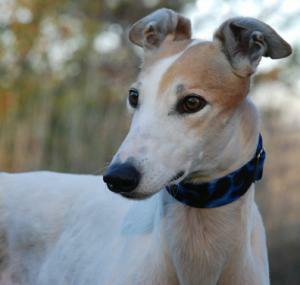 Magic is a sweet, friendly boy that just retired from the Orlando Race Track. He has 49 races listed and raced at 78lbs so is a bigger guy. His sire is Freak Show and his Dam is Malwa Passion. We just adopted one of his sisters from the same mom but out of a later litter - Canadian Passion. Magic's birthday is June 3rd. He is a calm, well behaved guy. When we spent time with him at the track he was very quiet in his crate and was careful not to mess up his crate. He did what he was told when it was time to go outside to potty and didn't have accidents in the kennel. He is mostly white with just a few red spots and the sweetest, most gentle eyes. He didn't pay any attention to the cats and small dogs at the vets office so seems like he will be fine to live with either. He has been living with a small furry white dog in his foster home and did well with him. Magic travels well and did great on the long trip up from Florida. He had a minor injury to his shoulder that caused him to retire but that is totally healed now. Magic has been a great foster and did great at his first meet and greet calmly soaking up all the attention that people gave him. He was good with kids and adults and didn't seem nervous. He was great on the shiny floors at PetSmart too. With his calm sweet nature he seems like he would be a really easy first greyhound. He is quiet in his crate so we think he would do well in an apartment or townhouse.